I love this book! It is an invaluable resource for every singer. It's like having a voice lesson in your living room with sixteen of the top voice teachers in the world all at once! On top of that, Joan has made it clear, once again, that it's the same voice you use when acting and when singing, and for classical, musical theatre and contemporary styles. A wonderful book that finally converges the body with singing and speaking! 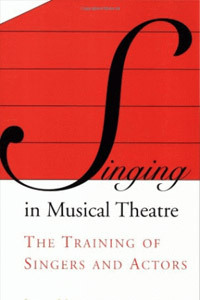 Melton enlightens the reader by presenting, in a clear manner, the notion that the training of singers and actors is most definitely interconnected. This book is an audacious project that succeeds. Joan Melton set out in 2004 to interview sixteen of the most influential musical theatre teachers in the world today, and discover their insights about teaching, their training methods and what drives them to do what they do. Melton's well-chosen questions and the generous approach of her interviewees make for a most fascinating result. It's an insider's view of sixteen superb teaching studios - which of us would not enjoy that? Joan Melton is a pioneer in the integration of singing techniques and voice training for the actor. A Master Teacher of the Fitzmaurice approach to theatre voice, she has taught at leading drama schools in the USA, UK, Australia and New Zealand. She developed the Voice/Movement Programme at California State University, Fullerton. Music theatre voicing is rapidly evolving into a most strenuous and demanding genre, both in the range of vocal qualities called for, the "triple threat" requirement and the punishing frequency of performances. As the demands have grown so has the curiosity of those voice teachers who work primarily in this area. This curiosity has engendered massive vocal learning. Some teachers have adapted a classical technique when it was inadequate for the needs of musical shows. Others have their roots in the theatre. Still more have travelled the path of voice therapy and voice science. What is clear is that there is an entirely new area of voice teaching opening up in our day, and we must be aware of its validity and its specific vocal needs. Joan Melton first asks each teacher to comment on six major elements of voice training for theatre: alignment, breathing, range, resonance, articulation, and connection, or the acting dimension. Then she asks the teacher to relate his or her approach to voice science and to the movement-based work that is a core element of actor training. This is where the fun begins! Take sixteen fine teachers and you get sixteen viewpoints. At first reading of the book this can be disconcerting - whom do we believe? As mature teachers they are all fairly categorical about their approaches. Registration, use of scientific terminology, role of movement, voice qualities, starting approaches - it's a minefield! Then as I read on, I felt a growing sense of exhilaration: the book shows that by our remarkably different paths we head for very similar goals. There is room for all. Joan Melton has drawn together some of the diverse threads in a concluding section, looking at comparative approaches and also outlining many of her own movement-based strategies. The book is immaculately annotated chapter-by-chapter, and these notes alone can send us on an exciting journey. Elisabeth Howard: I believe that anyone can learn how to sing and sing beautifully at any age and I have the need to prove this every day of my life. Joan Lader: What I expect to observe is that I'm moved, that there's some connection to their heart. Jeanette LoVetri: I want to be of service. I am here to support and get underneath the people who are singing, so that I can empower them to discover all of what the voice can do and be. Mary Saunders-Barton: For men and women the future is demanding: they have to be able to access all vocal options. And line honours have to go to Pat Wilson: What drives me is love. To me, it's the one fuel that doesn't clog up the system. When you burn that love, there's no toxic remains. I trust that the above comments send people rushing to this valuable book. You can read it bit by bit like eating very special chocolates, or you can spend the summer in a deckchair indulging in all of it. But read it! Katharine Watts, NZ Association of Teachers of Singing Newsletter.